I used the left side of my layout for journaling and kept it simple so it didn’t get too busy. Then my photograph and title went on the right page. I loved this giant phrase die cut!! So cute!! I hope you are all enjoying your summers!! Have you created with the Travelers Notebook kit yet? How do you like it?? Categories: Yearbook | Tags: Kit, soak up the sun, stephanie gold, Travelers Notebook, yearbook | Permalink. Donna here today to share my second project using the June Kit “Aquarelle”. One of the things I love about the monthly kits is their exclusive cut files and printables. You can find all of them here. For my layout, I used one of this month’s exclusives. The Floral Crown cut file. Before showing my layout, I want to share how I “weed” through cut files especially intricate ones like the Floral Crown cut file. I use a spatula like the one in the image to lift each cut carefully. I find this very helpful especially when I use a new mat (it’s super sticky compared to mats that have been used several times already). I love how my layout turned out with the cut file and fussy cut flowers and butterflies. The watercolor effect in the Wild at Heart collection by Cocoa Vanilla Studio is just beautiful! I lined up the series of photos in the middle and I used scraps of thin cardboard to add a bit of height to them. I also added some messy threads under the photos. This rubber charm is just so pretty! I hope you liked my project today and don’t forget to check out more cut files and printables in the store! 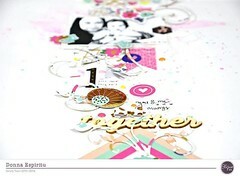 Categories: Yearbook | Tags: Cocoa Vanilla Studio, Cocoa Vanilla Studio Wild at Heart, Donna Espiritu, scrapbook, scrapbooking, yearbook | Permalink.